Preheat the oven to 160 Degrees C .
Mix sugar ,milk, vanilla essence and eggs via an electric hand mixer or manually until sugar gets dissolved. In a separate bowl add baking powder and flour and sift it . Slowly add the flour spoon by spoon in the liquid mix and stir it well to avoid lumps manually or via electric hand mixer. Place half of the apples on greased cake pan in a way they cover they cover the surface of the pan. Pour now the batter on top of your apples and place the remaining apple slices on the top of the poured batter, bake it for 30mins or more at 160 C, till you see the tester toothpick or knife edge comes out clean from the center . Remove from oven and allow it to cool on a rack. Remove the tart from mould. Slice it and serve with your hot cup of tea or coffee. 7-8 almonds cut in flakes. Mix sugar, vanilla essence, oil and egg via an electric hand mixer or manually until sugar gets dissolved. Add the chocolate powder and mix well. In a separate bowl add baking powder and flour together and sift it . Slowly add the flour in the chocolate mixture by one tablespoon and stir it well to avoid lumps . Add the yogurt and coffee and mix well. Add in the chocolate pieces and fold in slightly . Baking could be done in oven or microwave , I did this one in Microwave. Grease the microwavable bowl or silicone cake mould with some butter, pour in the batter. Put the microwave to medium high and cook for 5 minutes . Stop after 5 minutes , check with tester toothpick or knife , the tester toothpick should not come out sticking with chocolate of running consistency. Pour the batter in your greased baking mould and bake it for 30 mins to more until you see the tester toothpick or knife edge comes out clean from the center . For the moist cake, the toothpick doesn’t come pure clean , it doesn’t have to be running liquid. Remove the cake from mould. NOTE: If you want to skip eggs, add another teaspoon of baking soda to keep it airy and fluffy. Mix all the ingredients for the base pastry and knead it like the dough in a round ball.If the dough is too liquid ,add some more flour to keep the dough consistent , or if it is too dry add few drops of cold water and knead well into a smooth ball. Keep it covered for 15-20 mins. Roll out the dough into flat few cms high circle bigger than diameter of tin using rolling pin , dust with some dry flour and put the evenly flattened pastry into the greased tart tin covering its half edges.If there is extra dough discard it, don’t make it very thick otherwise it will make a very thick base. Preheat the oven to 160 Degrees C for 10 mins. Using a fork to make some holes in the pastry. Put some dry beans/rice on a foil and put it over the pastry dough inside the tin to avoid the pastry rising in the oven, Bake for 10 mins on 180 Degrees C until you see edges turning slightly golden. Take the tart tin out of oven and allow the pastry to cool.Discard the foil with beans. In a big bowl , Mix sugar ,vanilla essence ,yogurt, lemon juice and eggs via an electric hand mixer or manually until sugar gets dissolved. Add the lemon rind and mix well. 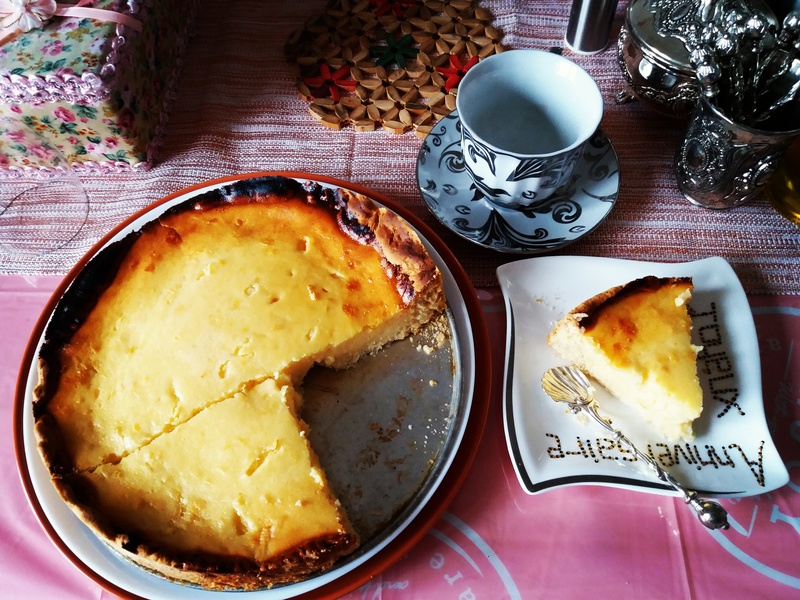 Pour this lemon mixture inside the tin and bake it for another 30-35 mins, till you see the tester toothpick or knife edge comes out clean from the center .The top is soft and light cheese cake like texture. Slice it, decorate with few lemon slices and serve with your hot cup of tea or coffee . Mix sugar ,oil, orange flower essence ,yogurt and eggs via an electric hand mixer or manually until sugar gets dissolved. In a separate bowl mix baking powder and flour and sift it . Slowly add the flour spoon by spoon in the liquid mixture and stir it well to avoid lumps . Add the lemon juice and orange rind and mix well. Pour the batter in your already greased baking mould and bake it for 45 mins to 1 hour, till you see the tester toothpick or knife edge comes out clean from the center . Meanwhile prepare the syrup by adding sugar or honey to orange juice and heat it on the medium fire for 5 mins till you see a syrup formation. Add the syrup to the cake inside the mould. Allow to rest till the syrup gets absorbed. 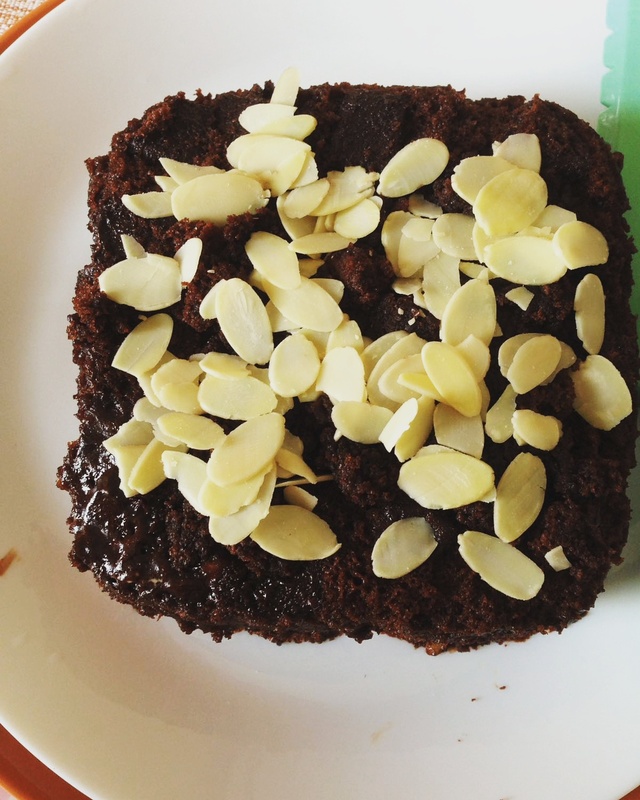 Slice it, decorate with few orange slices and serve with your hot cup of tea . Mix bananas, sugar , vanilla essence and eggs via an electric hand mixer or manually until sugar gets dissolved. Add the melted butter or oil and mix well. In a separate bowl add salt,baking powder and flour and sift it . Slowly add the flour mix in the sugar-eggs-banana mix and stir it well to avoid lumps . Add the chopped walnuts in the batter and mix. Pour the batter in your greased baking mould and bake it for 45 mins to 1 hour, till you see the tester toothpick or knife edge comes out clean from the center . Remove the banana bread from mould. Use an electric hand mixer to mix sugar , vanilla essence and eggs , Mix in till sugar gets dissolved and you get a fluffy mix. Melt the chocolate pieces in a bowl ( Microwave for a minute or two) . Cool it a bit. Add to the beaten egg mix , Slowly add in the chocolate powder mixing uniformly. Now add the whipping cream to the eggs and chocolate mix and fold in softly . Garnish with some chocolate scraps. Slices of lime and Almond flakes for garnishing. Mix the lemon juice , Lime juice ,vanilla essence into cream cheese using a spoon. Use an electric hand mixer to mix sugar and whipping cream in a separate bowl until it become light and foamy. Now add the mix of whipping cream to the cheese mix , taste the sugar and lemon in it, adjust to suit your taste if you like more lemon flavor or more sweet. Garnish with lime slice and almond flakes.